Hello everyone! It's that time of year again where we say goodbye to sunny summer days and accept the fact that it's time to bring out the winter wardrobe. Pinterest is my favourite place to go to for style inspiration and if you're a fellow Pinterest lover, feel free to follow me here. Today I wanted to talk about the trends and styles that I've been seeing a lot on Pinterest and absolutely loving, so I hope you enjoy it! Khaki, which has become a style obsession of mine in the last month, honestly I'd say 90% of my latest purchases have been khaki! In the winter I tend to wear a lot more black clothing, so I think khaki is a brilliant way of adding a bit of colour but at the same time it's still very neutral. I love the khaki coat in the top right of the picture above, it's got quite a military look, but still manages to look simple and elegant. Chunky knits, this is a reoccurring trend every year, but it's one I never get tired of. I love pairing a chunky knit jumper with a pair of skinny jeans for a laid back and super comfy look. I usually go up a size or two when buying knitted jumpers as I like the over-sized look. Lighter grey shades of knitwear seem to be very popular this year which I am a huge fan of. A twist on the classic black leather jacket, like the olive/stone shade in the bottom right of the picture above. Sure, I love a classic black leather jacket just as much as the next girl, but lately I've been on the look out for an olive or grey leather jacket to mix things up a bit. Blanket scarves and Capes, I've put these two together as I think they're pretty similar. I've seen blanket scarves worn as capes and belted at the waist which I love. I'm also loving the influx of capes this season, every shop seems to have a brilliant selection. Light grey knitwear/coats, as I mentioned above when talking about chunky knitwear, lighter shades of grey seems to be everywhere lately, whether it's a coat or a cardigan. I think the light grey shades give a very clean look to an outfit and again, if you're inclined to wear darker colours in winter, a lighter grey coat is the perfect thing to break up the darkness. 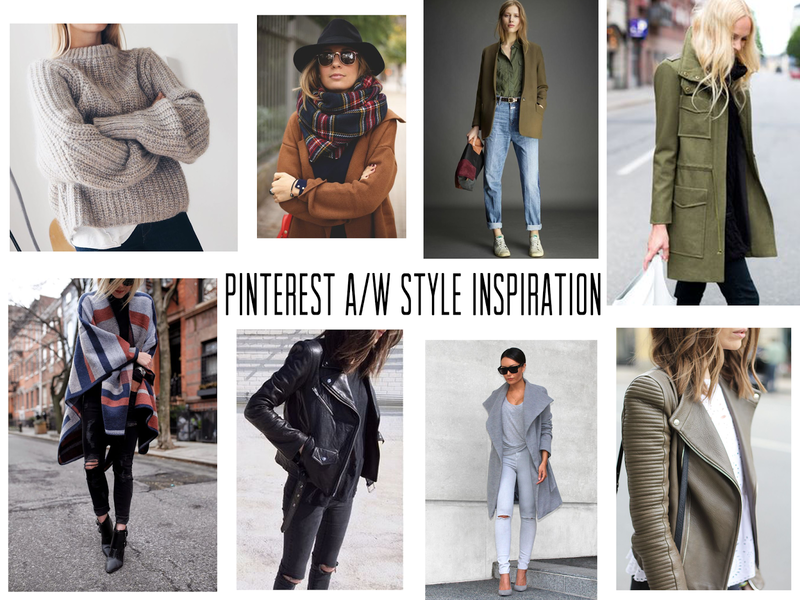 What are your favourite trends for A/W this year? Be sure to let me know in the comments and thanks so much for reading!